We spent a lot of time in school, so we think education is pretty important. We teach students and professionals the knowledge and skills they need to create medically effective, entrepreneurial solutions to brain health problems. We study the use of entrepreneurship, innovation, and technology to improve the health and healthcare. We advance research and publish insights on ventures and trends in the field to educate patients and the public on brain health innovations. If you're looking to learn more, Stanford Brainstorm has targeted educational trainings for startups, executives, investors, healthcare providers, government, and non-profit organizations. The course is being expanded for 2018. If you are interested in joining or sponsoring expanded educational efforts, please email brainstormlab@stanford.edu. "Dr. Vasan and Dr. Bandstra skip to a beat that keeps students engaged and inspired, highlighting the newest developments in the mental health space from both academia and industry. Very few classes at Stanford engage students with the same breadth and depth of knowledge like PSYC 240 does. Students come from all walks of campus life...a unique composition that facilitates greater lateral thinking, innovation, and an amazing classroom environment. This class represents Stanford at its best." "PSYC 240 helped me to better understand mental health from all different standpoints ranging from policy to education to technology and infrastructure. With the diversity of cultural backgrounds, as well as educational backgrounds in class - from undergrad freshmen to doctors and business and law school students, I was able to develop solutions to problems in psychiatry from various perspectives and approaches. 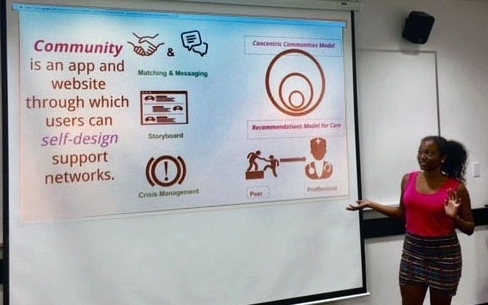 Overall I was incredibly impressed with the great work and final presentations of everyone in the class and inspired to continue to work on my mobile app and towards bettering mental health care." "Mental healthcare needs innovative solutions, and this course provides the perfect toolkit for students to make real change. Dr. Vasan and Dr. Bandstra have developed a thoughtful, rigorous approach for teaching students how to tackle the most important challenges in mental and behavioral health." Our team researches and writes about entrepreneurship, innovation, and technology to improve health and healthcare. We collect what we learn from clinical experience, direct patient care, working with scientists, industry partners, and payers, and translate learnings for patients and the public. We are working hard to distill the complexity of these diverse experiences and knowledge into the first book on brain health entrepreneurship and technology. Stay tuned for our blog where we will keep you updated with insights as we learn them. Our team also writes white papers in collaboration with our partners. Ready to take your idea to the next step? Collaborate with Brainstorm.